Best 3 week tour of Australia and New Zealand. World class coastlines, beaches and marine wildlife. Explore the highlights of both Australia and New Zealand by luxury coach. This is the best time to visit Australia and New Zealand. Start your vacation in Melbourne, and end it in New Zealand. When is the best time to visit Austrailia and New Zealand? Any time. Welcome to Melbourne. Transfer to your hotel and rest before dinner. You probablyadmired the Colonial Tramcar wending its way on the streets of Melbourne. Tonight is your chance to experience dinner onboard. This morning you’ll fly to Alice Springs. On arrival visit the Royal Flying Doctor Service and learn how this unique facility operates to provide a ‘mantle of safety’ to the people of the outback. Next stop is the School of the Air, which provides an educational facility for children living in remote areas. Then visit the historic Telegraph Station. ‘You’re invited’ this evening to experience the Aussie outback at Earth Sanctuary World Nature Centre. Enjoy a barbecue dinner and hear from Tom and Danny Falzon about the sustainable lifestyle they have established. Travel through the West MacDonnell and James Ranges and pause to view majestic Atila (Mt. Conner) often mistaken for Uluru, before arriving at Ayers Rock Resort. This afternoon is free for you to enjoy the resort’s facilities. Later, travel to the Uluru sunset viewing area. Witness and photograph the striking colour changes of Uluru (Ayers Rock ) at sunset while enjoying gourmet canapés and wine. This morning interact with local Aboriginal artists at a fun dot painting workshop. Your host will introduce you to Anangu culture and show how this is expressed in their artwork. Complete your own painting to take home as a memento of your experience. Later you’ll fly to Cairns. Spend time at the Cairns Wildlife Dome where you’ll encounter unique Australian animals before your flight to Sydney. You will be transferred to Sydney Airport for your flight to Auckland. Meet your Kiwi Tour Director for a ‘highlight dinner’ at The Langham. Your personal degustation is prepared for you from the freshest, quality ingredients, including mouth-watering seafood and delicious desserts. Travel into the Waikato region for a boat tour through the Waitomo Glow Worm Grotto. Continue to Rotorua and visit Te Puia with a local guide. ‘You’re invited’ to join the Tamaki family for a traditional Maori Hangi dinner and unique cultural experience at their family Marae. Explore Rainbow Springs Nature Park with a local guide. You may even spot a kiwi! Next stop is the Agrodome Sheep Show for a taste of farm life. Later, you’ll take your flight to Christchurch..
Board the famous Tranz Alpine train and travel over the Southern Alps to Arthur’s Pass. At Hokitika visit a local greenstone (jade) factory then follow the coastal road to Franz Josef Glacier, where you may take an optional scenic flight (weather permitting). Hotel: Te Waonui Forest Retreat, Franz Josef. (B, D)? Travel through spectacular rainforest and past Lake Wanaka. Then enjoy the tastes of delicious stone fruit at Cromwell, the stone fruit capital. Next visit the historic gold mining village of Arrowtown before arriving in adventure-capital Queenstown. Travel past Mount Cook National Park. Stop at Lake Tekapo and visit the Church of the Good Shepherd. ‘You’re invited’ to lunch at Morelea Farm, a typical working sheep farm, to discover an authentic taste of country life. This afternoon continue to Christchurch. Celebrate your vacation this evening at a farewell dinner with your Tour Director. itinerary.. From Sep 9, 2018, this itinerary changes to 21 days and ends in Queenstown. Get to know your Travel Director this evening at a Welcome Reception and dinner on board Melbourne’s famous Colonial Tramcar Restaurant. Today is free for you to further explore the delights of Melbourne. Alternatively you could take an optional trip along the renowned Great Ocean Road. Fly to Alice Springs this morning, and visit the School of the Air and the headquarters of the Royal Flying Doctor Service. This evening, join the Falzon family for a Be My Guest home-cooked gourmet BBQ dinner, and later listen as they speak of their passion for ecology, astronomy and culture. 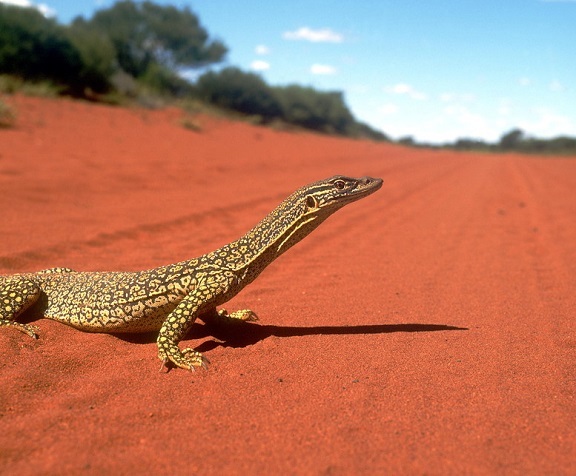 Travel through the rugged West MacDonnell Ranges to Ayers Rock. Sparkling wine is served this evening as you watch the sun set behind Uluru (Ayers Rock). Witness the magical Uluru sunrise, then tour the caves at the base of Uluru and see ancient rock art. Later, travel over red desert plains to Kata Tjuta (the Olgas), and take a walk through some of the tallest domes of this majestic rock formation. 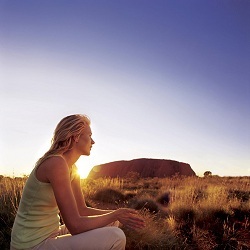 Enjoy sparkling wine with your travelling companions as the sun sets over Kata Tjuta. Join an Indigenous artist for a fun introduction to Western Desert Art. Your Anangu artist will provide cultural insights, explaining the meanings of local totems and help you paint your own artwork. In the afternoon, fly to Cairns. Today is free for you to pursue your own interests in vibrant tropical Cairns. Get ready for the experience of a lifetime when you board a high-speed catamaran and cruise to the Great Barrier Reef. You’ll have the opportunity to go snorkelling (equipment provided), or view the coral and tropical fish from the underwater observatory and semi-submersible craft. Enjoy a tropical buffet lunch on board before you return to Cairns. Dine tonight at a restaurant on the waterfront. This afternoon, fly on to Sydney, where your evening is at leisure. Enjoy a tour of the Sydney Opera House with a local guide before putting your feet in the sand at legendary Bondi Beach. Enjoy lunch on one of Sydney Harbour’s most prestigious cruise vessels, and spend the rest of your day exploring the city at your leisure. Today is yours for further exploration of Sydney. And then celebrate your last evening in Sydney with your Travel Director at a waterfront restaurant. Fly across the Tasman Sea this morning to the island nation of New Zealand. Meet your Travel Director for dinner at your hotel. Start the day with a sightseeing tour and a cruise on Waitemata Harbour before time at leisure. You’re invited to a Be My Guest lunch at the home of Lance and Bridgette O’Sullivan, New Zealand horse racing royalty. Enjoy a sumptuous country-style lunch at the Red Barn on their beautiful Waikato farm. This evening enjoy a traditional Hangi Highlight Dinner and cultural performance at the Tamaki Family Marae. Explore Rainbow Springs Nature Park, where you’ll be able to observe many species of native fauna of New Zealand. You may even spot a kiwi! Visit Te Puia thermal reserve before flying to Christchurch. Travel on the TranzAlpine train to Arthur’s Pass. Regarded as one of the world’s great train journeys, it passes through fertile farmlands to rugged gorges and ice-fed streams and lakes. At Hokitika visit a greenstone (jade) factory. Take a short walk to view Franz Josef Glacier. Climb over the Haast Pass, winding past lakes and along the Kawarau River and Gorge. Visit historic Arrowtown before arriving in Queenstown. Travel over the Devil’s Staircase to Te Anau and then through the rainforest of World Heritage listed Fiordland National Park, sighting glaciers and mountain ranges. Drive through the hand-hewn Homer Tunnel to numerous photo opportunities afforded by the Mirror Lake, Cleddau Valley, the Chasm, Mitre Peak and Bowen Falls, on your way to Milford Sound. Enjoy lunch while you cruise on this natural wonder. Return to Queenstown this evening. A full day to explore Queenstown at your leisure. You could take a 4WD minibus excursion through Skippers Canyon. Join your Travel Director for a Farewell Dinner at the Boatshed, with its views of Lake Wakatipu and the Remarkables. Say farewell to your fellow travelers when your holiday comes to an end this morning after breakfast. Call 1-800-221-2474 9AM - 6PM Mon-Fri Eastern Time or (516) 248-2042 outside USA/Canada Although we have provided as much information as possible on our website, we are happy to answer your questions directly on the phone. Sometimes, it is just easier to speak to one of us. We are awaiting your call.